While it may not be one of the most glamorous parts of the shooting sports, regular and thorough cleaning of your firearms may be one of the most important. 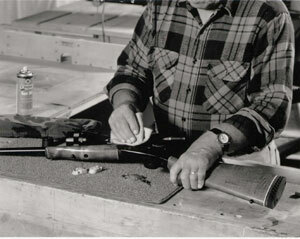 Like any preventative maintenance program, gun cleaning can do much to extend the service life of your firearm. Beyond the obvious benefits of cleaning and oiling, each time you clean the firearm causes you to look at and handle it in a complete way. A thorough cleaning gives you an opportunity to inspect the gun for any apparent defects or patterns of wear which could cause a serious problem in the future. A good cleaning after each use can do much to retain your firearm's new look and feel. It can also do a great deal in terms of accuracy. Each shot causes a slight buildup of fouling inside a rifle barrel. A thorough cleaning after each use keeps fouling to a minimum and maintains accuracy at like-new levels for much of the rifle's service life. The other time that a thorough cleaning is important is after a long period of storage. During storage, oils can become gummy and cause the firearm to not function properly. Congealed oils in a barrel can also elevate pressures upon firing by slowing the bullet's progress down the bore. This could lead to a dangerous overpressure situation. It is always best to fully clean any firearm that has beeen stored for more than a few months. Finally, it is good practice to clean and visually inspect any new firearm before its first use. Most are treated with oils to preserve their finish, which should be removed before firing. All of these good safety habits will add to the safe practice and enjoyment of the shooting experience.